IEM Miri, in an effort to have Miri included in the ongoing BEM roadshow pertaining to the proposed amendments to the Registration of engineers Act 1967, paid a special call on the political secretary to the Minister of Energy, Green Technology and Water, Dato’ Sebastian Ting, on the 24th Sept 2012 at his office in Miri to seek his help. 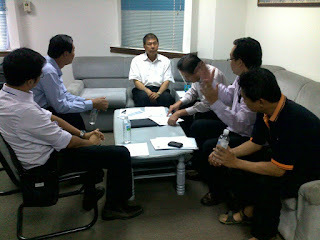 The appeal delegation was led by IEM Miri Chairman, Ir Goh Soon Boon. The delegates explained to Dato’ Ting that we had only sought his assistance because our earlier appeal through IEM internal channel had not been successful. Due to Sarawak’s unique geography (which supported two IEM Branches), the significant presence of practicing and aspiring engineers in the Northern Region and the importance of the amendments we would like to appeal to YB Dato’ Seri Idris Jala being the sponsoring Minister (& CEO of PEMANDU) of the Roadshow to reconsider our request. Ir Goh also handed over a formal IEM Miri’s appeal (addressed to Dato’ Seri Idris) to Dato’ Ting. Dato’ Ting was very supportive of our position and would help to channel our appeal as appropriate.